In this Photoshop Effects tutorial, we're going to look at an easy way to give a photo a split toning effect. The term "split toning" means we'll be adding a color tint to the highlights using one color, and then using a different color to tint the shadows. The two colors you use can be similar, giving you a subtle effect, or they can be complete opposites. It's really up to you and the effect you're going for. Whichever colors you choose, split toning an image can be a great way to add more visual interest to a black and white photo. As with most things in Photoshop, there's several different ways to create a split toning effect, but in this tutorial, we're going to look at one of the easiest ways. We'll be using a couple of Photoshop's adjustment layers, one to convert our full color image into a custom black and white photo, and then another to add our colors to the highlights and shadows. A nice thing about this technique, besides being easy, is that it allows us to create the split toning effect without harming a single pixel in our image! The photo after applying a split toning effect. Click on the "New Adjustment Layer" icon and choose "Channel Mixer" from the list. Select the "Monochrome" option at the bottom of the Channel Mixer dialog box. In the center of the Channel Mixer dialog box are three sliders, labeled "Red", "Green" and "Blue" from top to bottom. These sliders represent the red, green and blue color channels in the image. If you want to learn more about color channels in Photoshop, be sure to check out our RGB and Color Channels Explained tutorial in the Digital Photo Essentials section of the website, but basically, these three slider bars allow us to create a custom black and white version of our photo by mixing different amounts of the red, green and blue colors in the image to give us different results. Dragging the red slider towards the right, for example, causes any areas with red in them to appear lighter in the black and white version, while dragging the slider towards the left causes areas with red in them to appear darker. The same goes for the green and blue sliders. There are no "correct" settings for the sliders, since each image is unique and your idea of the "perfect" black and white version of the image will also be unique, so the best thing to do is to simply drag the sliders around while keeping an eye on your photo in the document window until you're happy with the results. Drag the Red, Green and Blue sliders to create a custom black and white version of your photo, making sure the total of all three is 100% when you're done. The image after converting it to black and white with the Channel Mixer. Keep in mind that we haven't really converted the image to black and white. The original full color photo is still there, sitting safely on the Background layer in the Layers palette. 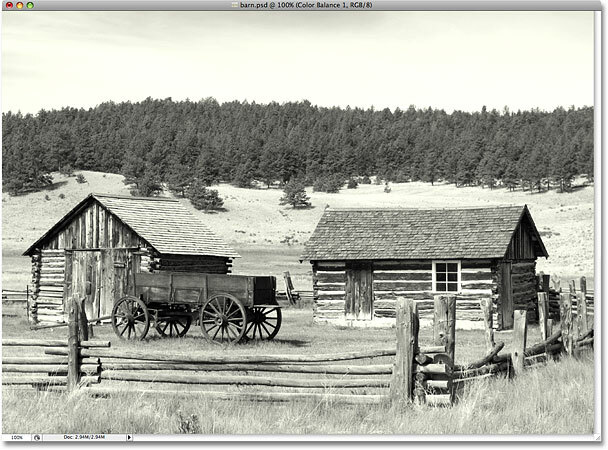 Everything we've done to convert the photo to black and white is being handled by the Channel Mixer adjustment layer sitting above it in the Layers palette. If we were to delete the adjustment layer, our full color image would appear in the document window once again. Add a Color Balance adjustment layer. Select the "Highlights" option in the Color Balance dialog box. Dragging the bottom slider towards the left to add yellow to the highlights in the image. The highlights in the photo are now tinted with yellow. Select the "Shadows" option at the bottom of the Color Balance dialog box. Dragging the top slider towards the right to add red to the shadows in the image. The Layers palette showing the two adjustment layers used to create the split toning effect. The final split toning effect. And there we have it! That's how to create an easy split-toning effect with Photoshop! Visit our Photo Effects section for more Photoshop effects tutorials!